One of the many questions we get regarding our Myrtle Beach condo rentals is what is the difference between an oceanfront condo and an ocean view condo. If you take the words literally, they both mean the same thing. If the condo is oceanfront, then obviously you have a view of the ocean. No? These aren’t literal definitions though. Let’s explain. 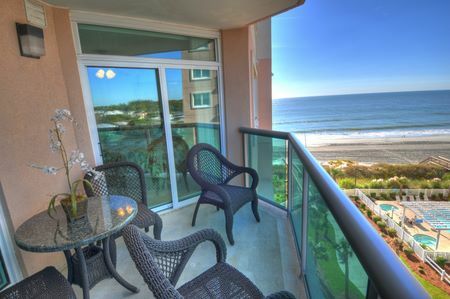 Oceanfront Condo – Notice How the Beach is Parallel to the Balcony? Myrtle Beach condo rentals that have an ocean view, on the other hand, might still have a very nice VIEW of the ocean, but your balcony might be on the side of the building, rather than in the front (or back, for that matter). These condos generally are less costly, simply because you are not paying for the view. There is no difference in actual quality of the unit itself. You can still expect your tiled floors, jacuzzi tubs, and granite countertops – just not the view. Keep in mind, there are other types of an ocean view condos as well. If there is a home or condo on the second row, there still might be a good view of the ocean – but you might need to walk an extra 100 feet or over the road to get to the beach. Ocean View: You can still see the ocean, but it’s not directly in front of you. We have a wide assortment of both oceanfront and ocean view Myrtle Beach condo rentals. Summer is already booking up fast though. Don’t hesitate too long. The best condos are already sold out! I always wondered about that. Thanks for clearing that up! All the things listed are true; however, the article fail to mention there are pros and cons with both units. Oceanfront – plus direct oceanfront; cons – unit may not get too much sunlight inside the unit. qb makes a good point. Even the seasons have a lot to do with where the sun will shine into the unit. 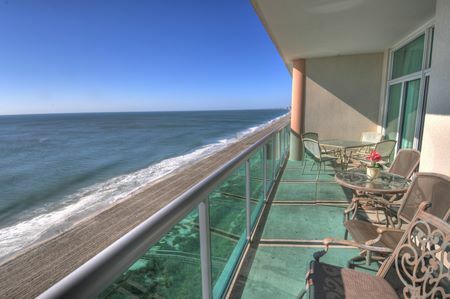 How can you resist the stunning view of the Atlantic from an oceanfront rental! I always choose oceanfront!